Recebi o artigo “Are important corporate policies understood by employees? : A tracking study of organizational information flow” por um dos autores, Owen Hargie 😉 thank you! Downs, C. and Adrian, A. (2004), Assessing Organizational Communication: Strategic Communication Audits, Guilford, New York, NY. Goldhaber, G. (1993), Organizational Communication, 6th ed., WCB Brown and Benchmark, Madison, Wisconsin, p. 374. 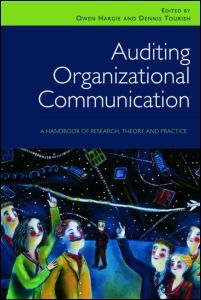 Hargie, O. and Tourish, D. (Eds) (2000), Handbook of Communication Audits for Organizations, Routledge, London. Irving, P. and Tourish, D. (1994), “An integrated communication strategy for health service managers”, Journal of Management in Medicine, Vol. 8, pp. 53-7.